& from France / Française including Cholet. There are many confusing reports about just what this album is, when it was made and why it was made. Doing a little 'Sherlock Holmes' detective work, I think I can make a very good guess. If you know better than this, please contact us. This album is Track 2856 001. The only other with this sequence catalogue number is the equally rare 'Electric Jimi Hendrix', which is Track 2856 002. Both were manufactured by Polydor & both have poly lined inners dated 0970. From the 'Mail Order Only' tag, the matching catalogue numbers and dated inners, it's clear that both LPs were issued at the same time & both were probably withdrawn at the same time. They were most probably manufactured as an exclusive for an early incarnation of 'The Audio Club Of Great Britain', Polydor's mail order outlet, which continued to issue LPs with exclusive 'ACB' catalogue numbers well into the mid seventies in the UK. The exact reason for them being withdrawn is not known, but it could have something to do with the labels being changed from Track to Polydor that year & the consequent re-releases of the original albums [from which these two were compiled] on Polydor. 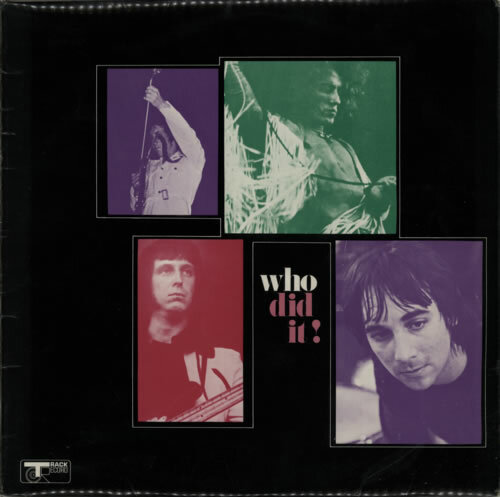 Either way, it is estimated that under four hundred copies of 'Who Did It!' went out and under three hundred of 'Electric Jimi Hendrix' before they were recalled and destroyed. This is a unique compilation of the tracks from side one of 1966's "A Quick One" & side one of 1967's "The Who Sell Out". It's rare and then some. Being a compilation of previously released material and only available through the Record Club, it didn't sell well at the time and with existing stocks being withdrawn, recalled and destroyed soon after, very few made it into the wild. The unique picture sleeve has minimal ring wear or edge scuffing and is front laminated. All titles are clearly visible & the spine is fully legible. Unless you knew that this was by The Who, you would find it difficult to tell as the band name is not listed separately anywhere. The front of the sleeve shows just a little laminate creasing with a bit of lift in the bottom right corner. The back does have one score mark, which has ended up looking quite artistic by some fluke, as it underlines the pink 'Who did it!' title quite nicely. Needless to say, it shouldn't be there, but it has managed to be quite in keeping with the sleeve design, which has minimised the effect. The score has missed all the unlaminated back cover text, which remains clearly readable and in far above average condition. The sleeve was printed by Polydor records. The poly lined inner is dated 0970, meaning that this was pressed for release on or after September 1970. The vinyl is in nice condition, showing very little evidence of play, with just a couple of visible surface hairlines & no significant pops or clicks evident. There are minimal marks around the spindle hole & no writing or other defects to the label. This is amongst one of the best copies of this album that we have seen, as most are found in poor condition. Although not 'Mint', this manages to remain a very acceptable copy of this incredibly rare LP & to offer one in a condition that is still of investment quality like this is highly unusual. Not one we're likely to get again in a hurry and several hundreds of pounds cheaper than the semi-mythical 'Mint' copy would fetch, so don't hang about to be disappointed! Product Information The Who Who Did It! - EX UK vinyl LP album (LP record).